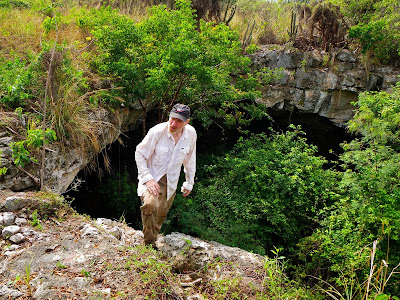 Tom Miller gave us a call to see if we wanted to explore some caves in the Dry Forest of Guanica. You know our answer. Jeff had just found the largest of these caves (the day before) while hiking with our friend Toni who lives near Copa Marina. She doesn't have a headlamp and Jeff didn't bring his so they just peeked around and didn't really see much. 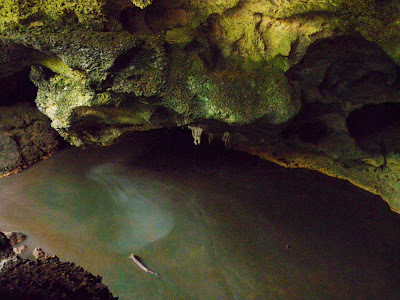 So today it was a mission to go inside and find out about the other caves of Guanica. We parked inside the gate and then headed up a real trail bearing left off of it on a sort-of trail. 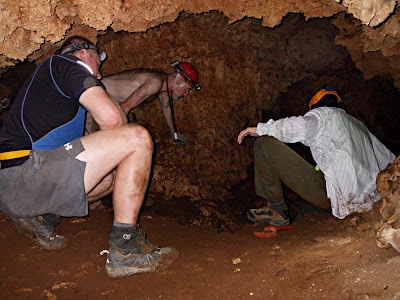 Tom knew exactly where a couple caves were and we stopped at one so he could take a water sample and then headed to Guano Lake Cave. 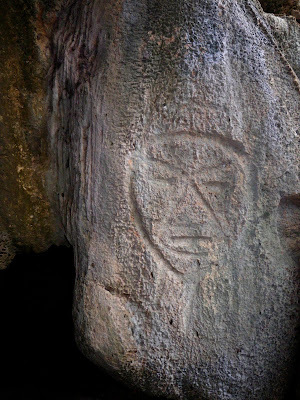 This is the first thing we saw when we entered - a nice petroglyph. We scrambled into a large opening and were looking at this large vat of guano enriched water. Jeff poked his hiking sticks into the brew and discovered it was quite soupy and deep. 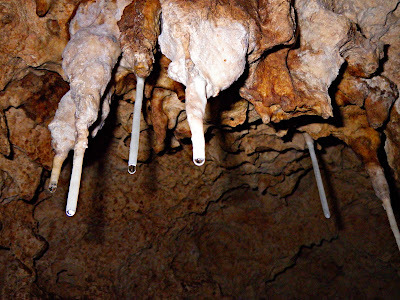 There were some nice little stalactites and some tunnels veering off to the sides that looked like they might open up. There were a lot of bats flying around. 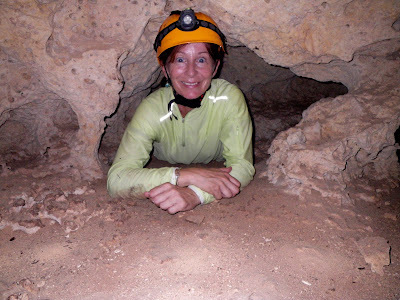 Today no one wanted to step into the quicksand - we had another cave to explore and a "sea cave" everyone had heard about. Walking around in the scratchy, itch-making cactus brush while encrusted in guano just didn't sound fun. 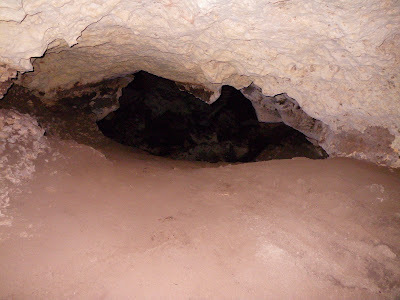 We encountered some toads on the edge of Lake Guano and after spending 20 minutes or so and taking a few measurements we pressed on to the large cave. It is hard to see in this photo, but in the middle bottom there are a couple people. This trip was just Tom Miller, his wife Diana, Jeff and I. The opening is impressive and there are a few interesting side tunnels and some little holes. At first we thought we'd spend only 30 -40 minutes in it, but as you explore you see more...you find small holes...you go in them...and before you know it is has been a couple hours. One of the neatest things we found was a tunnel that led to a little hole that was full of water. That's what everyone is looking at. This was a well of sorts that had a gauge already in place to measure water levels. The entrance of this cave had a couple survey flags as well so someone is doing some kind of animal life survey or water level survey or something here. 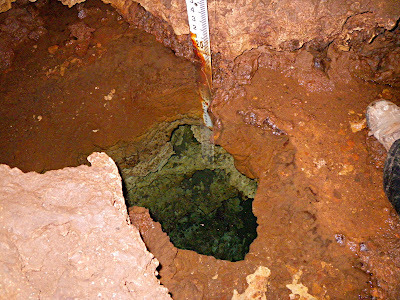 This well was crystal-clear and turquoise and seemed like an odd thing to find in this location. This tunnel was pretty high up off the ground level so it was just weird for it to be there. In the upper part of the cave there was an area that had kind of a 3 layer affect and the dimensional feel made it fun to climb through even though it dead ended in a small pocket. Up higher still was an area with a few "straws" forming. These are especially interesting and we haven't seen that many of them. 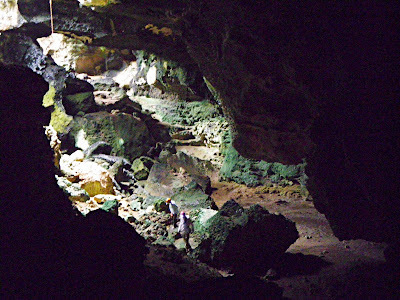 There is a tunnel that crosses under the collapse area and around the tunnel and along the bottom are many spaces below huge fallen boulders and slabs. Jeff pointed this one out and had to suggest I go in it - he was joking but I like a challenge. At first I had second thoughts since it sort of slid down. No one would go with me and I thought it might be tough to come back up it if it didn't lead out somewhere else. I don't know if this photo is of the area I investigated or not but it is similar. I prefer to go feet first if the area is small so that's what I did and had a pocket I could squat in. Then it snaked to the left pretty flat and had another bigger pocket and then another you could see light in. If I had to I could maybe have climbed up the area to get out but it was pretty high. I went back the way I came. It was pretty weird to be under everyone else and I could hear them but it was hard to judge their position in relation to mine. Wow, amazing pictures! Somebody has to do this type of stuff! I am glad you guys are the "adventourous ones"! Hey, I am having a small party in Rincon in March, you guys are invited!